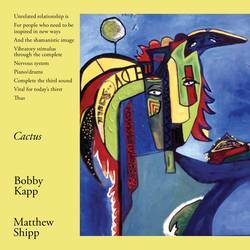 Drummer Bobby Kapp and pianist Matthew Shipp are legends of free jazz. Improvisation is their arena, and through a series of albums they have proven unique musicians they both are. Strangely enough, the two have not crossed paths in the past when it comes to recoding, apart from Kapp's album Themes 4 Transmutation. In Cactus the two are thrown into a more immediate dialogue, which spirals through heavy avantgarde piano lines and frantic rolls to bluesy tones and subtle cymbal hits. What is very interesting in this case is that the two artists rose into prominence at different times. Kapp is someone who was part of the great New York free jazz scene of the '60s, even though he was not a band leader at the time. Shipp on the other hand, arrived in the scene during the '90s. That gap in time makes things even more intriguing, as the two musicians aim to bridge it. This is a high-level conversation between two great performers, and in most part it is about reacting. Versatility is key in this realm, and both Kapp and Shipp are quick in responding to queues from one another. Each action brings a reaction, making the album feel like a constant push and pull between the two, as each turn one makes forces the other to go the extra mile. A fluid story telling derives from this practice, with the coherence being retained from one track to the next, granting a sense of continuity and a terrific narrative to the record. It also proves the dexterity of the players that in here they are dealing with instruments that are percussive. A duo comprising of drums and sax would make things appear less frantic, but throwing a piano next to the drums results in rhythmic dissonance. It is an album filled with these rhythmic structures, a set of laws in a musical universe of the duo's making, that is sometimes followed but mostly broken. It does not of course mean that Kapp and Shipp rely only in their heavy improv and rhythmic textures, and they do find some space to explore a bit of melody, registering a more emotional tone, as the ending of “During.” The process works brilliantly and it shapes Cactus into a great record of free jazz explorations, completed by a drummer's drummer and avantgarde pianist. The writing in the album cover mentions that this is “vital for today's thirst” and it is very hard to argue with that. Posted Oct. 31, 2016, 5:28 p.m.